Lemon Harangue Pie: Easy-Bake Oven, R.I.P. 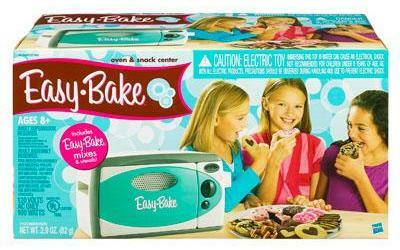 The Easy-Bake Oven as we know it is dead. Thanks to the Energy Independence and Security Act of 2007, which outlaws the manufacturing of most incandescent light bulbs, the favorite appliance of prepubescent pastry chefs will be getting a makeover. We are aware that the 100-watt incandescent light bulb will no longer be available beginning in 2012. In fall 2011, Hasbro will launch the Easy-Bake Ultimate Oven, introducing a new way to bake for the next generation of chefs. This new oven features a heating element that does not use a light bulb and offers an extensive assortment of mixes reflective of the hottest baking trends for today. I'm picturing something that uses a compact fluorescent bulb and takes a week to bake a cupcake. Such are the innovations I've come to expect in a "green" society.